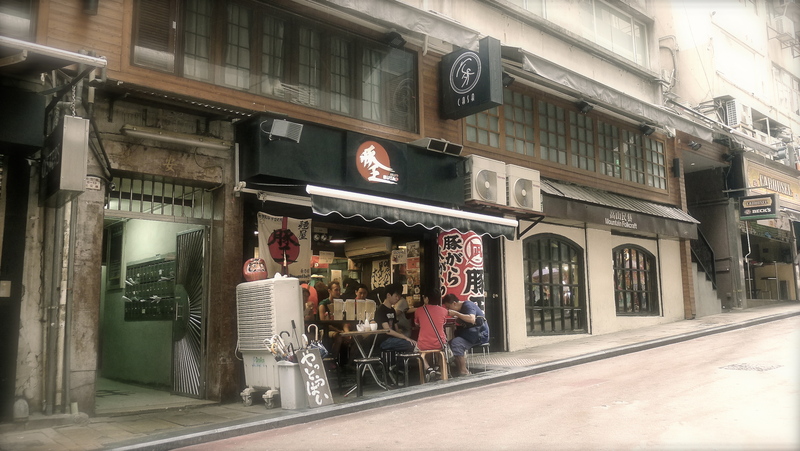 Butao Ramen is a 15 or so seat hole-in-the-wall ramen joint tucked away on the upslant of Wo An Lane Street in Central. It opens at 11am. Due to a light drizzle and a “quick breakfast” on Gage Street which consisted of the best and of the oldest milk tea shops and a renowned dan ta (egg tart) establishment, we arrived at 11:45am. The queue, located across the street from the shop (pictured above), which by the way looks more like a small shack, was already 82 people deep; all seats were filled with noodle slurpers and we weren’t even arms’ length away to gawk, envy and breathe down the necks of the diners in hopes of invoking a quicker turnaround time. I’d heard this place serves 200 bowls a day and that’s it. The hours are 11am until 86 noodles. I was determined to get my slurp on [that day] and told myself that the wait [in the rain] just added to the experience, that perhaps it would make for a better story later. All of the sudden, one of the female staff came over across the street to us and began ushering half of the line up the hill. Other queuers behind us followed suit. As a party of 3, we quickly divided ourselves between the two lines and I set forth to find out what the shuffle was all about, and more importantly, which line would gain us noodles quicker. Apparently the server had sent the tail end of the line to the top of the hill as a second line. 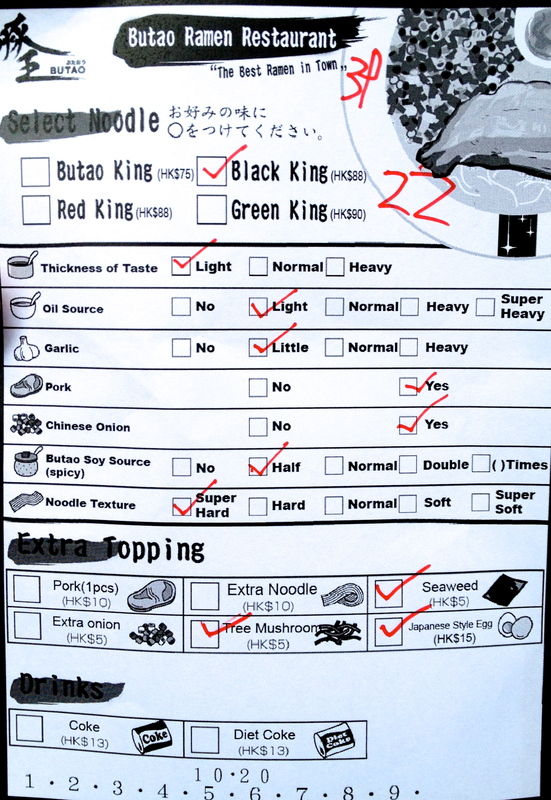 So if you ever find yourself queueing for Butao, be sure to keep calm and in order to noodle on, stay put! Let others shuffle, but you will stay in the original queue if you want to slurp sooner. We were promoted from 82 to 33 just like that and waited 40 minutes tops. My co-diners and I opted for Butao, Black and Green. This is the Butao ramen, the signature, pork bone broth (tonkotsu folks, not tonkatsu). A velvety broth with just the right amount of creaminess so it coats your mouth, your tongue, flavors lingering as you slurp on; yet it isn’t overly sticky to make you grab for a gaseous beverage. A combination of long-simmered pork bones and rich layers of umami flavor kept me ramening on; I’d conjecture it was dried mushrooms and dried seafood. 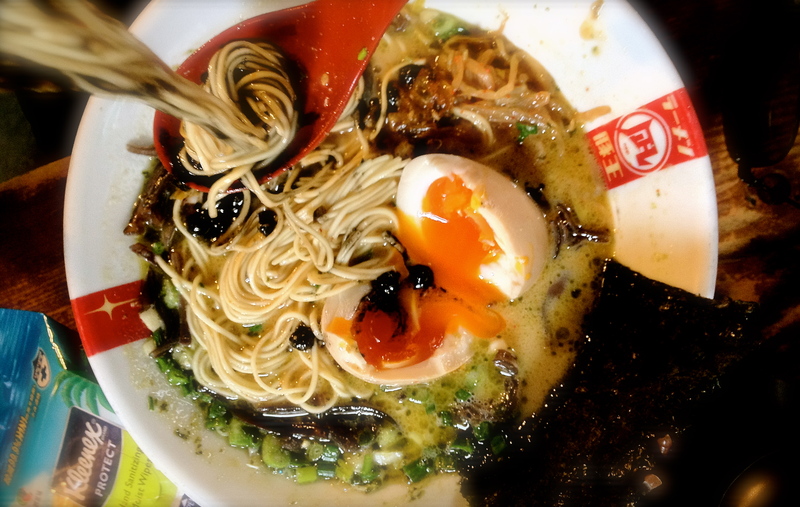 A firm believer in palate fatigue, I also believe an excellent bowl of ramen keeps PF at bay with layers of flavor and texture in the broth, noodles and toppings. This was just that. Excellence in a bowl. The orange-yolked egg was cooked just as I like it with its runny yolk and soy-flavored white from marination. The charsiu was thinly sliced and well-balanced in fat and lean meat. The tree mushrooms added extra QQ (Taiwanese term referring to the “bite”, “chewiness” or “al dente” of any food item) to the dish, just what it needed because one can only slurp so fast and noodle QQ-ness begins to decline the longer it sits in a hot broth (sorry noodles, you were long, thin and dericious, but only for the first three minutes). I could eat tree mushrooms for breakfast, lunch, dinner and dessert. Another topping: the spicy, pickled beansprouts! Exclamation point, indeed. Another contributor in preventing PF. This is why ramen restaurants don’t require an intermezzo or palate cleanser. The spicy, pickled beansprouts! Another exclamation point well deserved. Oh, did I mention they’re piled high, never-ending and available on the table the entire time? Cha-ching. The tissues, on the other hand, are self-provided. You’re in Asia. BYOT. Squid ink, black sesame, black garlic oil? Yessss. This is a ramen like no other: rich, nutty, and of the sea. It’s like surf and turf done right, and right in your bowl. Land meets sea. Pork and squid? Yes, they can live in harmony…in that bowl. 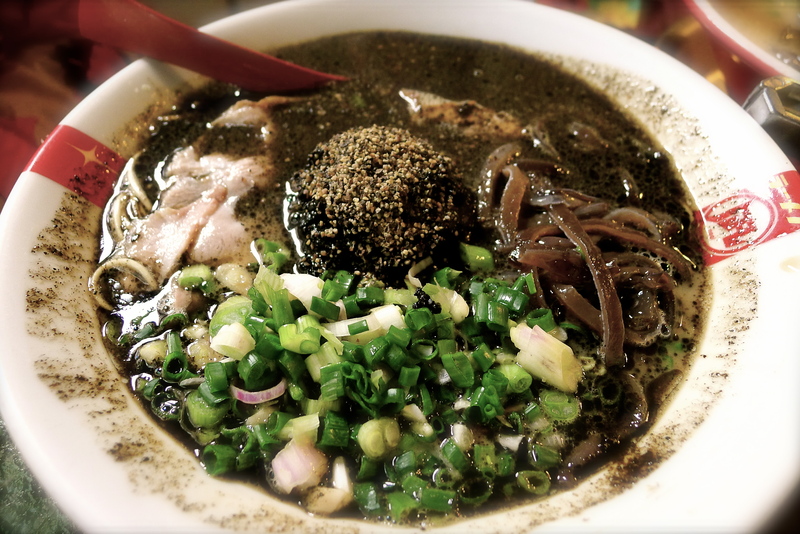 Once you go Black, well, you will go back [to Butao Ramen]. For the sake of sharing, here is the Green Ramen, a pesto and parm based bowl. Not my favorite so I won’t ramble on. But dang, those spicy, pickled beansprouts are mighty dericious. Due diligence is a beautiful thing when it requires slurping at the right places. Ever since eating my way around ramen joints in Tokyo and at the Yokohama Ramen Museum and working with Guchi of Guchi’s Midnight Ramen, I’ve found it increasingly difficult to come across a decent bowl. 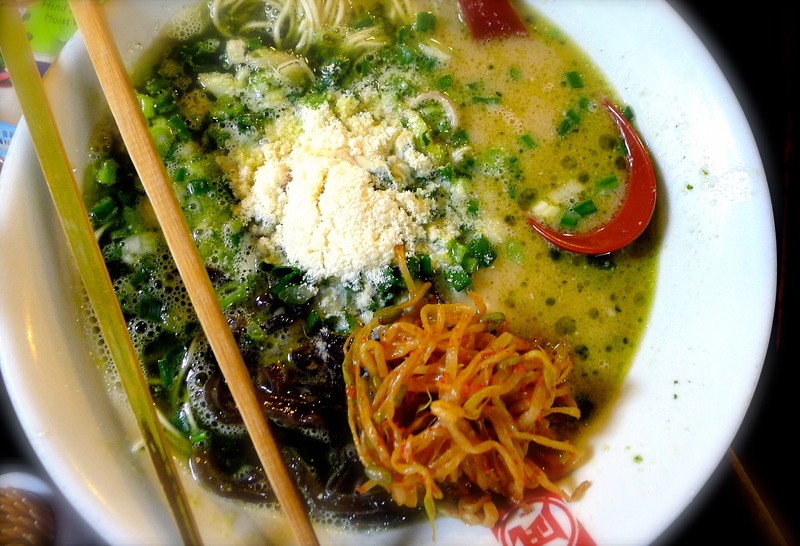 Common pitfalls include: watery broth or the opposite, exceedingly viscous broth, one-note broths, one-note tares, flavorless toppings, easily broth-logged noodles, greasiness, and overall imbalance in flavor and texture. This is coming from a girl that used to eat packaged ramen + seasoning packet + spinach + egg + togarashi every day after school after sports before dinner at 6pm. I’ve had my fair share of noodles, from the packaged to the handmade. I know a “composed bowl” if you will is not rocket science, and is not composition at the Michelin level, but it requires balance in flavor and texture, thought and execution. Fundamentals of good cooking and good eats. CNN coverage of Butao Ramen. This entry was tagged Butao Ramen, dericious, egg tart, Guchi's Midnight Ramen, Hong Kong, milk tea, noodles, QQ, ramen, slurp. Bookmark the permalink.